Letters obtained by The Nation show that companies involved in the oil, gas and coal industries are increasingly pushing workers to vote Republican. A picture of a sign posted recently inside a CONSOL Energy workplace. In a bid to assert their influence on issues relating to climate change as well as environmental and labor regulations, fossil fuel companies are making an unprecedented election-season push. Documents obtained by The Nation reveal that oil, gas and coal companies are taking advantage of the Citizens United Supreme Court decision to not only blanket swing states with ads but also push their employees and contractors into voting GOP. The Nation has also obtained a letter blasting the Obama administration sent recently to natural gas lease-holders in North Dakota. In the letter, Continental Resources CEO Harold Hamm urged recipients to elect Republican Rick Berg to the US Senate. Hamm, a billionaire who is credited with helping author Romney's energy plan, writes that Berg “has consistently fought for lower taxes for us” and warned that “your opportunity to receive royalty and bonus payments may also be impacted” by the election. The Citizens United decision liberated corporations to not only endorse candidates to their workers but also express similar election communications to their vendors and customers. Last month, In These Times magazine revealed that Koch Industries, a company highly involved in the fracking industry, has incorporated almost every facet of electioneering into its campaign push. The company, which has chemical facilities and Georgia Pacific plants employing up to 2,000 in Ohio and Pennsylvania, has sent a letter advising its workers to support Romney. The move underscores how partisan the coal and gas industry has become. CONSOL’s voter guides have been distributed in conjunction with their lobby group, the National Mining Association, which has mobilized coal companies throughout Ohio to get out the vote. Alpha Natural Resources, Patriot Coal, Caterpillar and Rosebud Mining Company have also posted links for their workers to view the NMA’s “Mine the Vote” voter guide. The stakes are high. The NMA, which has purchased 150 election-themed billboards in states like Ohio and Virginia, has made legislation to exempt coal companies from laws regulating coal ash in drinking water a top priority on Capitol Hill. Though coal firms have tried to portray Obama as simply “anti-coal,” lobby disclosures show that they have spent much of their money seeking to undercut an overhaul in safety standards. The NMA led the charge in defeating a bill to update mine inspection rules in the aftermath of the Upper Big Branch disaster. 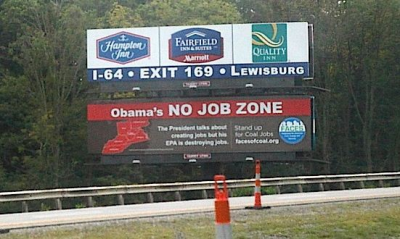 One NMA billboard reads “Obama’s NO JOB ZONE” over a map of Appalachian states. Workers are quickly learning that in this election, coal company executives will do anything it takes to elect the Romney-Ryan ticket. Earlier this year, the largest privately held coal company in the United States, Murray Energy—another NMA member company—was caught forcing its workers to stand behind Romney at a political rally. Now, the NMA has released a new campaign video featuring that rally to claim Romney supports coal jobs. A later investigation by The New Republic also revealed that Murray Energy’s CEO was calling out in e-mails employees who did not donate to his list of preferred GOP candidates. Spend a day on the campaign trail in one of the swing states, and the influence of the fossil fuel lobby is hard to escape. A bus tour from a group called “FACES of Coal,” a NMA-backed organization, is touring Virginia and other states along with Republican candidates. NMA’s other publicity vehicle, “Count on Coal,” is using social media to spread the word about the election. And on CNN and major television networks, yet another coal lobby trade group, American Coalition for Clean Coal Electricity, has spent some $12 million so far. Coal and gas companies are powering even the biggest Super PACs. Americans for Prosperity, a right-wing advocacy group financed by Koch that is spending over $140 million this year, just announced $3 million in television ads in Michigan and Pennsylvania, and has at least five field offices in the Keystone State. Six-figure donations from Oxbow Carbon, Alpha Natural Resources and Cumberland Natural Resources have allowed pro-Romney Super PACs American Crossroads and Restore Our Future to saturate states like Ohio with negative television ads. The fossil fuel industry is expected to be working to overcome the revived sense of urgency to address climate change after the devastation of Hurricane Sandy. House Democrats are again urging hearings on the effect of global warming on extreme weather events. Next year, the Environmental Protection Agency will continue to develop regulations to curb carbon emissions. Corporations reliant on burning fossil fuels are hoping a change in administration, or more pro-polluter pressure from Capitol Hill, could overturn the EPA’s efforts. Jack Gerard, president of the American Petroleum Institute, the lobbying group that represents CONSOL Energy and other companies pressuring their workers to support the Romney-Ryan ticket, may have the chance to orchestrate a major political payback if President Obama is defeated on Tuesday. According to insider reports this week, Gerard is among the top contenders to be Romney’s White House chief of staff, or his secretary of energy. For Gerard to get the job, it may depend on efforts by fossil fuel companies to convince workers that they could lose theirs if Obama wins. Murray Energy Corporation replies to the allegations in this post.